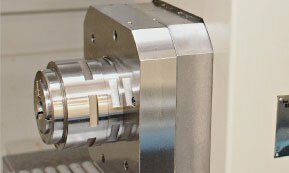 Built-in motor spindles for both main and back spindles deliver quiet and reliable operation as well as fast response. 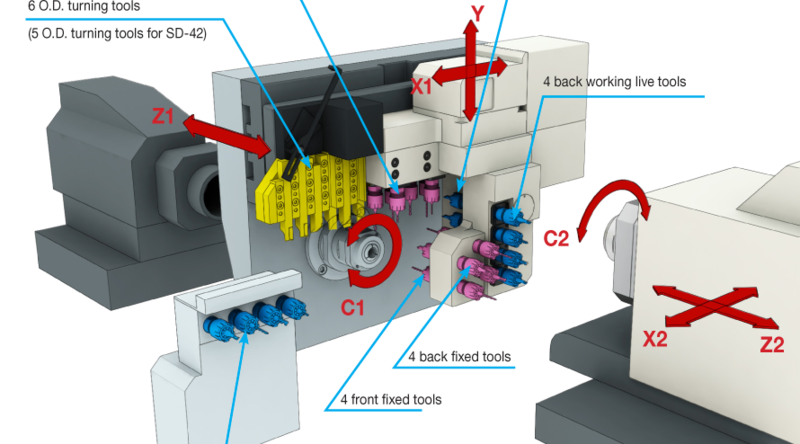 The addition of a new backworking toolpost increases maximum tool load from 26 to 31. 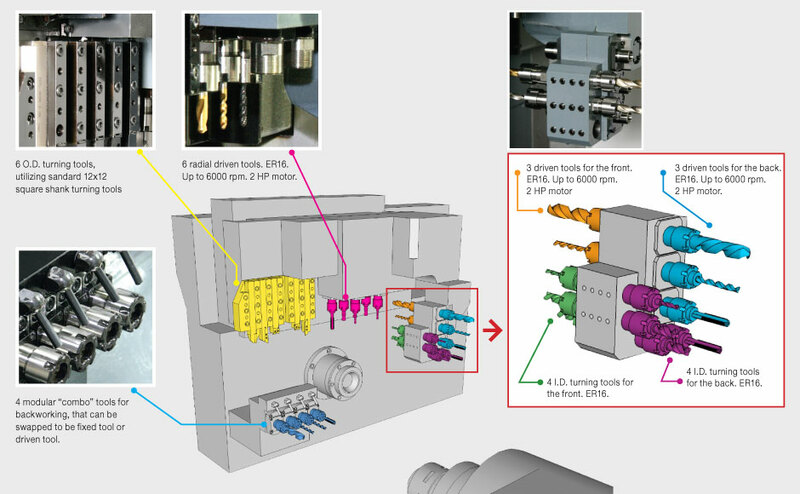 Keeping more tools on the machine helps reduce setup time for future jobs and increases flexibilty in coming up with different machining strategies. SD-32/SD-42 can handle workpieces as long as 250mm (9.8”) without re-chucking. 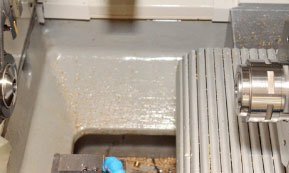 The wide tooling zone has the benefit of making tooling setup easiser and faster, making it easy to discharge parts at the front even for long parts as well as making chip disposal eaiser. SD series covers different bar diameter sizes to match customer needs. SD-12, SD-16 and SD-20 offer 12, 16 and 20 mm bar capacities, respectively. The 4-station backworking toolpost is a modular setup that can hold either driven, or fixed tools or a mixture of both. It presents the user with more setup flexibility from one job to another. 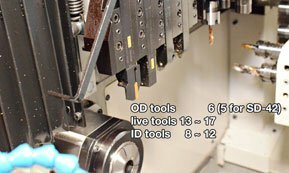 The SD-series is fully capable of milling, drilling and engraving with live tools. 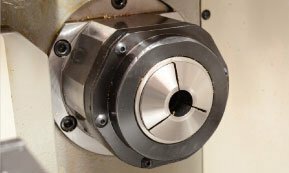 It comes with 0.1 degree C-axis as standard on both turning spindles. 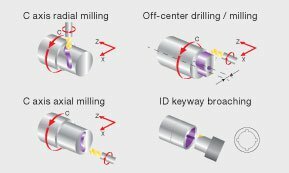 The full, continuous C-axis can interpolate with other linear axes simultaneously for helical and other complex tool motion. 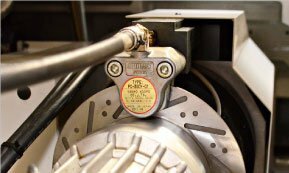 Hydraulic disc braking is a standard on both main and back spindles. 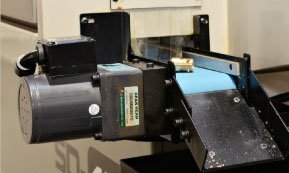 This feature can turn the spindle into an highly rigid indexer. There is also an option for two-stage hydraulic braking system that can stabilize the spindle without it being completely clamped to a stop. 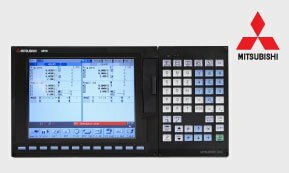 The new and improved Mitsubishi M70 CNC control is a 2 channel control that allows 2 independent toolpaths and provides machining on main and back spindles simultaneously. New high resolution LCD display and faster processing speed further increase user productivity. 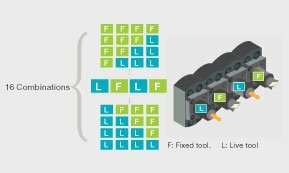 The addition of a new backworking toolpost increases maximum tool load from 26 to 30. 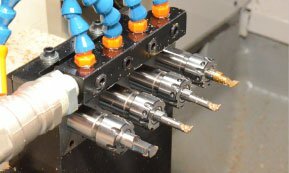 Keeping more tools on the machine help reduce setup time for future jobs. 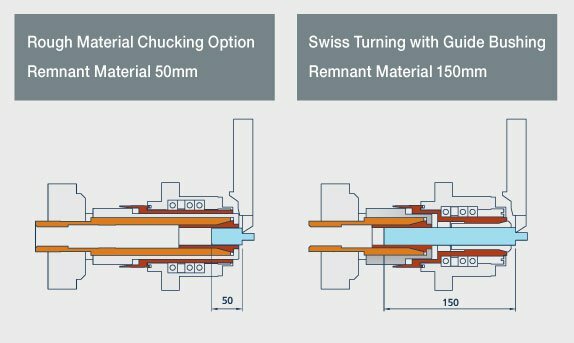 With the rough material chucking option, a user can easily convert SD series to run without the guide bushing. 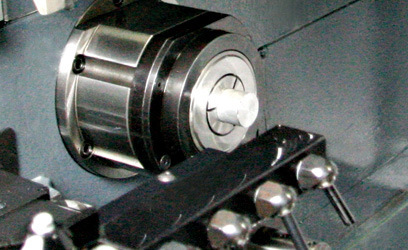 For parts with less overhang (machining length less than 3 times the bar diameter ), the rough material chucking option allows the main spindle to extend into the cutting area. 2.allowing the use of less expensive non-ground bar stock (as much as 0.1mm bar tolerance).